Even the ocean is warmer than usual. Up and down Coastal Highway cars were trying to make it to the beach. 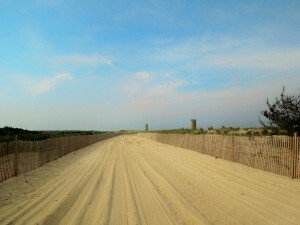 Oh, well it is that time of the year and the Delaware Beaches are ready for all our visitors. Everything looks in top shape. So, if you are in town check what’s going on at the Nation’s Summer Capital. Until July 17th – the 39th Annual Members Craft Exhibition at the Rehoboth Art League located at 12 Dodds Lane in Henlopen Acres. Numerous artists are exibiting their work, for sale, as well, in the Corkran and Tubbs Galleries. More info? Please call 302-227-8408. The Rehoboth Art League has many events during the summer season, including the 63rd Annual Cottage Tour. For information, please visit http://www.rehobothartleague.org and click, events. Until August 21st. Every Tuesday, Heidi Lowe Gallery will offer classes for people of all ages and abilities. 5 p.m. until 8 p.m. 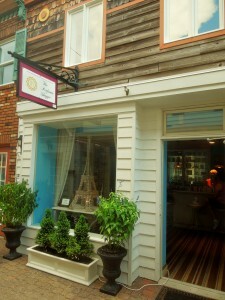 The Gallery is located at 328 Rehoboth Avenue. Tel. 302-227-9203. Website? 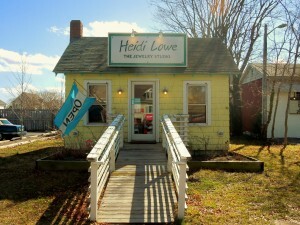 www.heidilowejewelry.com. Until September 2nd – Clear Space Summer Repertory Season is underway. Love the theatre? The 2012 Season brings Annie, Broadway at the Beach, and Cabaret. It is Live Theatre 6 nights per week, from 7:30 p.m. until 9:30 p.m.
Clear Space Theatre is located at 20 Baltimore Avenue in Downtown Rehoboth Beach. Tel. 302-227-2270. Website? www.clearspacetheatre.org. You can purchase tickets online or stop by the Theatre. 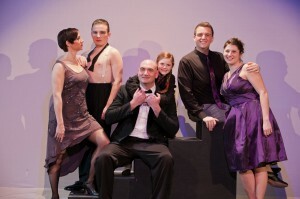 Cabaret just opened on 6/28. Annie opens on 6/30. Broadway at the Beach opens on July 5th. 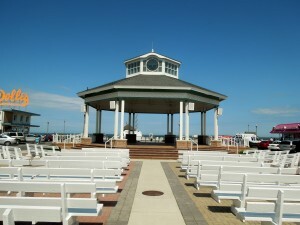 Rehoboth Beach Bandstand – Summer Concert Series 2012 – Entertainment Saturday, 6/30 and Sunday, 7/1. Performances start at 8:00 p.m.
Saturday, 6/30 – Separate Ways The Band. www.separatewaystheband.com. It is the Ultimate Journey Tribute Show on the east coast. The closest you’ll get to see the early – mid 80’s line-up of Journey live ever. 5 amazing musicians recreating the music. Sunday, 7/1 – U.S. Army Downrange – Please visit www.usarmyband.com to read more about this military band and their mission statement. A light summer meal is what we all need on hot summer days. 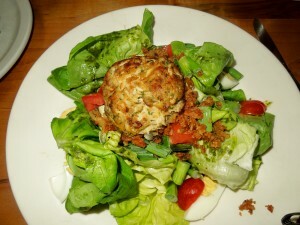 Dogfish Head, located at 320 Rehoboth Ave. has a great Cobb Salad with a basil vinaigrette dressing. 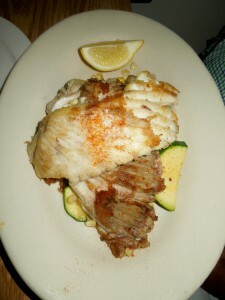 Have it plain or top it with fish or with a crab cake, like I did. Thought I would pass that tip on to you. Keep cool. But, if things get to warm wherever you are, then head out to Epworth United Methodist Church. It is an Emergency Cooling Center. It is open from 1 p.m. until 7 p.m. during Heat Advisories and Excessive Heat Waves. Please call 302-227-7743, ext. 105 to confirm that they will be opening. To get to the Church, turn right after Tomato Sunshine on Coastal Highway (Rt. 1). I thought the corn was looking taller than the knee high by July…. From a distance I spotted the orange bins. Hmm…I did not know Freeman’s corn was in. Well, a sharp turn into the corner of Plantation and Robinsonville Roads. It was late in the day, but they still had some. Corn started to come in last week. Freeman will be open at 11 a.m. every day. 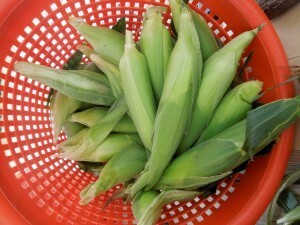 Not only do they have the best corn, but their local produce is delicious. 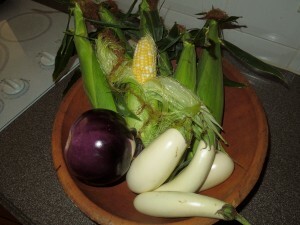 Today’s temptations, besides the corn, were eggplants. I love them all. Those little white ones are so sweet. 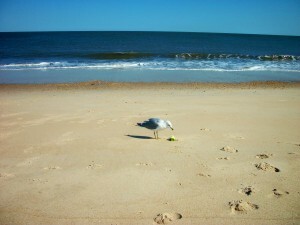 In the summer, our beaches are full of visitors. The ocean is the reason for their visit. Getting out of the hot cities for a little R & R.
But, you know what? 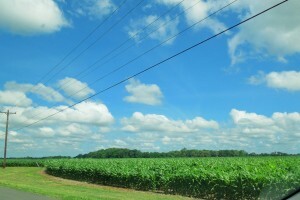 I love driving through Sussex County. We have the best of both worlds. The ocean and the bay for the fresh catch of the day. The farmers provide us with gorgeous produce. 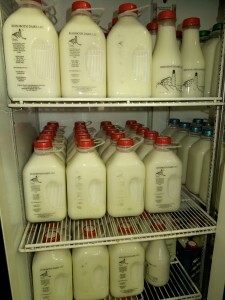 The dairy farms…well, you already know I am a fan of Rehoboth Dairy. Best milk; just the way milk should taste. They also have meats, vegetables, ice cream..stop by, because you might even catch Earl barbecuing. Rehoboth Dairy is located at 37217 Rustic Acres Ln. Tel. Take a right on Hollands Glade Rd, after Tomato Sunshine. Continue almost all the way to the back. Farm will be on the left. Tel. 302-245-8308. Hope you have a great week-end. If you are visiting for awhile, then check some of my favorite places. Fragrances, colognes, perfumes…they are an “essential element to any wardrobe”. But, as I write this post I know that some women and men don’t wear colognes, at all, for a variety of reasons, including job related reasons. I have a friend that doesn’t wear perfume because “I am allergic to bees”. Okay… Next, another friend just only wears perfume once in a blue moon. Then, I have the ones that stick just to one cologne and that’s it; a signature. This past Monday, remember, when it was pouring and lightning and water spouts going through Dewey?…..well, Susan and I were inside a perfume shop that I had heard about the year before. We did not have a care in the world and proceeded to make ourselves at home. 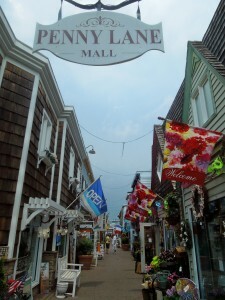 Penny Lame Perfumes is located at 42 Rehoboth Ave., Penny Lane, Rehoboth Beach, DE 19971. Tel. 302-226-2444. Website? http://www.pennylaneperfumes.com. Please check the website to know more about this interesting shop. The owner is Cindy Carey. She was not there on Monday, but Cassandra Parker was. My friend, Susan, actually, knows both of them. Introductions were made. Cassandra proceeded to tell us more about their products. 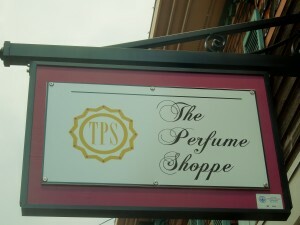 Originally, I thought they customize fragrances to suit your style. But, no, that’s not it. Niche Perfumery is an alternative to mass perfume production. Niche houses are showing up everywhere. I think it is because we are all so tired of being, as Susan said, geared to brand names. Niche houses tend to have their own perfumer in charge of the fragrances of the house, just like it was was in years past. I wear perfume every single day. No kidding. I love it. I usually tend to buy frangrances that are green, sporty, and light. This post is written with gentlemen in mind, as well. 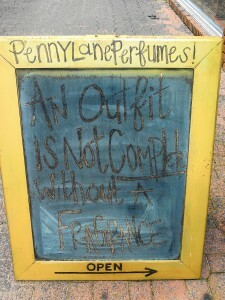 Penny Lane Perfumes has beautiful perfumes for men, also. Men can go through the same process as women. Just like Susan and I did. Test, test, and more testing. Don’t be shy, Cassandra is an expert. Casandra helped us discover a “world of liquid emotion”. While I would say no to one fragrance, Susan would love it. 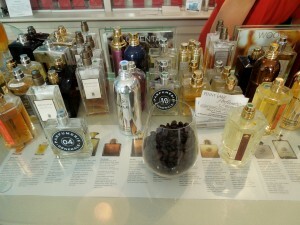 There are over 200 fragrances in the store; exotic flowers, spices and rare woods. 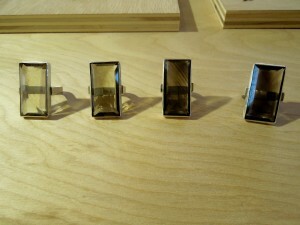 You can wear them by themselves or combine them with other fragrances for a real customized scent. That was the best part, just trying to achieve that scent. We tried so many of them. We also had the coffee beans on hand to neutralized odors, as well. 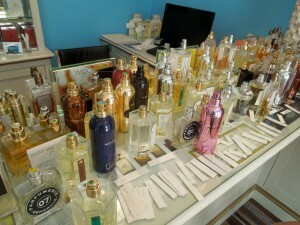 Niche Perfumery is sold only by distributors and approved retailers. I fell in love with one called Premier Figuier Extreme from L’Artisan Parfumeur from Paris. It was light and delicious. That’s how I would describe it. Then, went a little outside the box with one from Paris, as well, called Montale; Roses Musk. Also light. Susan, on the other hand picked Opus with a very earthy scent. These perfumes are meant to last a long time. Just spray in the morning and you are good to go for the whole day. Trying them on is a must, because they really adjust to your own body. When trying fragrances, spray, but do not rub. 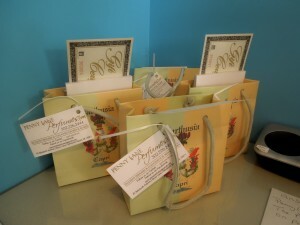 Penny Lane Perfumes has gift certificates available, as well. Leaving, knowing that we would, definitely, come back…Susan and I wanted the same thing, an uncommon, personal fragrance. I think we got it!! Matt’s Fish Camp is now a year old. I feel the same way about this restaurant today as I felt when I first visited. 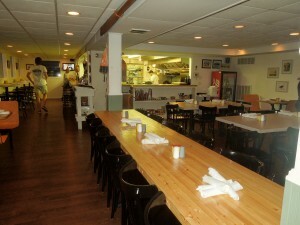 It has the essence of casual coastal dining; steps from the ocean and across the bay. Come as you are; or just put something casual and enjoy the culinary competence, the good service, and that relaxed ambiance that we all love at the beach. It was such a gorgeous day. 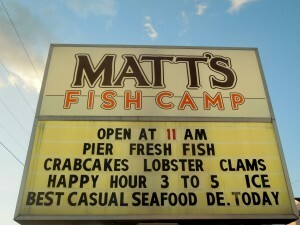 As I was driving home from Bethany Beach, I passed Matt’s Fish Camp. I knew exactly where I was going for dinner. Looking forward to it, as well. I wanted to see if they would fill my expectations, and see if they were just as good as before. 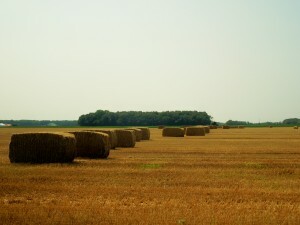 Afterall, is the Summer of 2012. 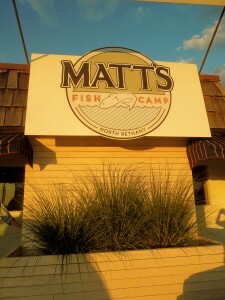 Matt’s Fish Camp is located at 28635 Coastal Highway (Rt. 1). It is really in North Bethany at Tower Shores. Plenty of parking available. Tel. 302-539-CAMP. 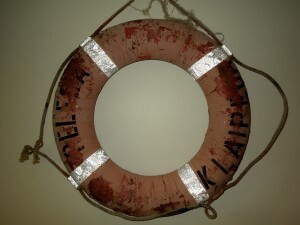 Website http://www.mattsfishcamp.com. Matt’s Fish Camp is part of the family of restaurants, owned by SoDel Concepts, whose Owner and Head Chef is Matt Haley himself. Matt’s Fish Camp opens at 11 a.m. daily and stays open pretty late too. It does not accept reservations. I have a new strategy since I do not like to wait; going at the latest possible time. Arrive when almost everyone is finishing their dinner. Perfect timing for photos. That’s exactly what we did tonight. We got a table for two. I was also paying attention to what the people on the next table were saying. There were 3 guys; a delicious meal, they were commenting among themselves. I love the long table in the middle of the room. To fill it with friends would be wonderful. We started with a few appetizers. I already knew what my entree would be. 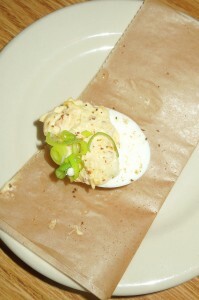 Lobster Deviled Eggs. Again, I had to be fast with the camera. One of them was gone by the time I turned my head. A good amount of lobster and great taste. 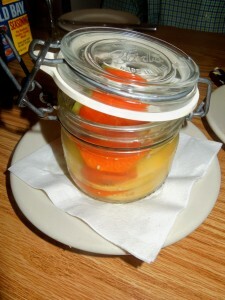 The Semi Spicy and Homemade Pickles, served in a jar, I really liked. On summer nights, light with a slight kick. The first time we ordered skate was at Matt’s Fish Camp last year. Tonight we ordered it again and asked to be cooked gluten free. It was served over mashed potatoes. Even though the restaurant was comfortably crowded still, the chef did not mind it at all. Skate is delicate and mild; from Chincoteague, Virginia. I decided to have the Fried Baby Tails. 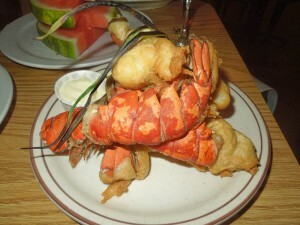 I was served 4 tails, beer battered and fried. They were really good; well seasoned and oh soooo tender. The dipping sauce? Just right. We both ordered watermelon as a side dish. This was excellent; a seasoning of salt, pepper, paprika and other spices. Lemon on the side. 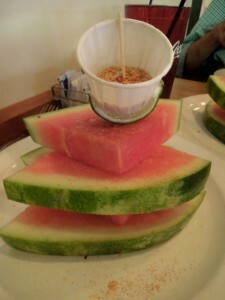 Having watermelon as a side dish is so refreshing; it also cleans your palate. Coffee, pictures….that was it. Sorry, not a sweet ending on this evening. We were perfectly content. We then headed home. It only took us about 10 minutes to get to Rehoboth Beach. Note: Anastasi was our server. She was friendly, knew her menu well, and was very attentive. She also knew about the gluten allergy; no explanations were necessary. You can also access Matt’s Fish Camp’s website on AboutMyBeaches, right under links, or you can also click on the banner of SoDel Concepts on the right hand side of my website. Both, will take you directly into their sites. My friend, Susan, and I were out and about in Historic Lewes, Delaware, just a couple of weeks ago, when almost at the end of our stay we decided to visit Saint Peter’s Episcopal Church. 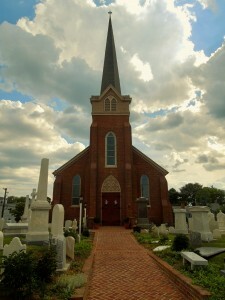 Saint Peter’s is located in the heart of Lewes at 2nd & Market Streets. Tel. 302-645-8479. Website? www.stpeterslewes.org. The Church was open, which is a rarity these days. It was so quiet. We sat down to absorb this small and beautiful church, whose parish was established in 1681. 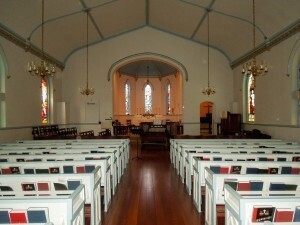 The original church building was completed in 1724, and sat in front of the current one. 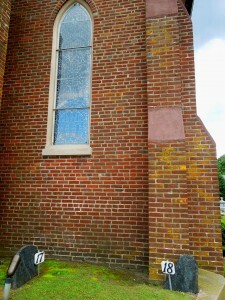 A second church was built in 1808 and had a small bell tower. The bell that rings every Sunday is from that bell tower. The third and present building was built in 1854. 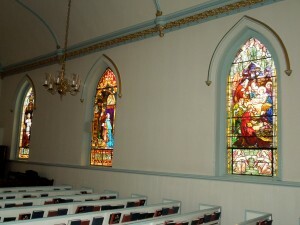 The Church is surrounded by stained glass windows; “The Story of God in Pictures”. 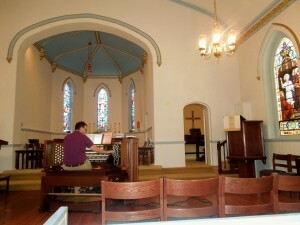 All of a sudden someone came out and sat in front of the organ and proceeded to play. At first we were the only ones there. A concert for us only. He was probably the director. 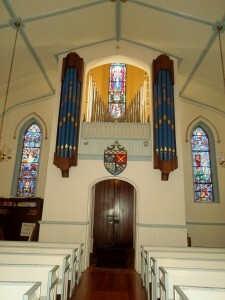 If you would like to check the choirs and music at Saint Peter’s, please visit http://www.stpeterslewes.org/#/worship-music/st-peters-organ. Saint Peter’s has a beautiful Parish Hall that offers school, nursery and also a store with books and gifts. 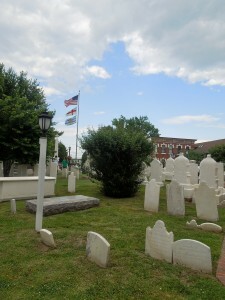 Saint Peter’s owns the oldest cemetery in the state of Delaware. This particular cemetery is visited all the time. There were people walking, reading all the stones. I don’t think many of my friends like to visit cemeteries. To me, they are a snapshot of time. 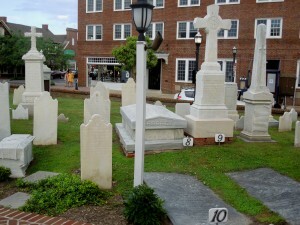 At Saint Peter’s there are about 18 noteworthy graves. They are marked and easy to find. The two oldest ones are somewhat together, near a wall by the Church. The oldest stone had inscriptions that were hard to read; Here lyeth ye body of Margaret ye widow of James Huling who desert Febry ye 16th in ye 76th yeare of her. The second oldest one is also from the Huling family. 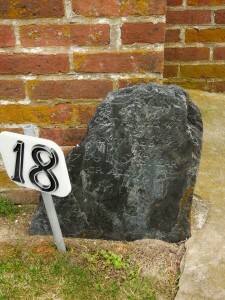 A portion of the stone is broken so the whole inscription cannot be read. 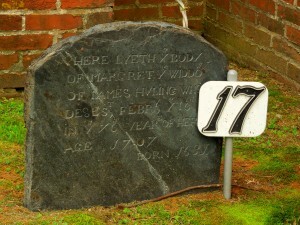 It said: Huling Martha his wife decest Febry ye 1708 in ye 8th year of her age. We were fascinated with the fact that when reading the dates, we realized some of them lived really full lives. The grave marked as 8th was the tomp of Caleb Rodney, the 23rd Governor of Delaware, born in 1767 and died in 1840. The 9th Grave was from Hon. Caleb S. Layton, sometime Associate Justice of the Superior Court of the state, born in 1798 and died in 1882. The 10th belonged to Dr. Henry Fisher, born in Waterford, Ireland in 1700. He was probably the first physician of eminence in the territory now known as Delaware. 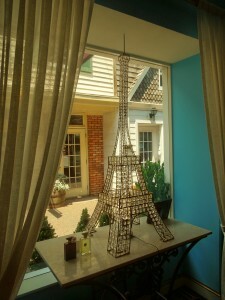 If you are visiting Lewes, please do stop by. They are so interesting. The labyrinth is an ancient symbol found in many traditions around the world. It is different from a maze; it has only one path with no tricks or dead ends. It does not create anxiety; you are not solving a puzzle. It does lead us to the Source of our solutions, creating peace. Susan and I decided to walk it. The winding path becomes a mirror for where we are in our lives, touching our sorrows and releasing our joys. It is to be used as a form of walking meditation to help find inner peace, manage stress, make decision and heal physically, emotionally and spiritually. I was following Susan and was trying to follow what she was doing. I don’t think I meditated much. They say that each walk is unique for each person. 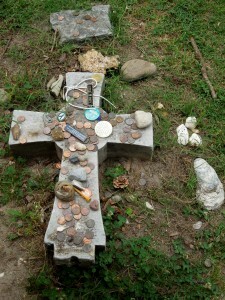 After we reached the end…there were offerings left by other walkers. 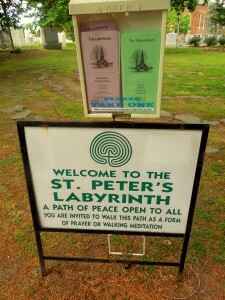 St. Peter’s offers 2 Labyrinths to the community. There is the outdoor Path of Peace, the one we took. 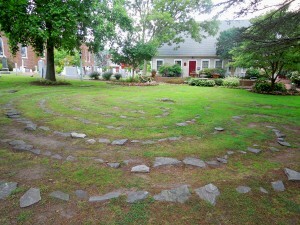 And, then there is the 30 ft. circular Chartres design Labyrinth which is used for indoor guided walks and special events. For more info., regarding presentations, retreats and other special events, contact Mary Van House at 302-684-1652. Our visit to Saint Peter’s Church was the perfect ending to one pretty day. Susan and I had not seen each other for many years, so spending the day with her was just priceless!! 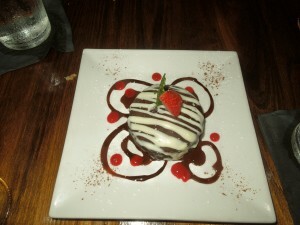 Turning out to be one of my favorite restaurants in Delray Beach…. 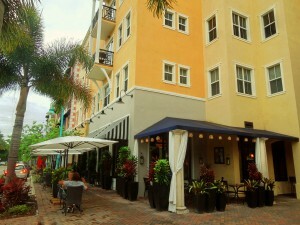 Brule Bistro, located at 200 NE 2nd Avenue. Tel. 561-274-2046. Website? 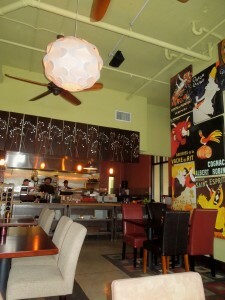 www.brulebistro.com. I remember when Pineapple Grove was just starting out. People did talk back then that it would be an extension of Atlantic Avenue. To some extent, it is. But, it has much more. It has a unique flavor. Lots of little restaurants, boutiques, apartments, gyms, even postal service. Most importantly, it is an artist’s colony, as well. So, when you live in Pineapple Grove, everything is accessible; Atlantic Ave., just a stroll away. 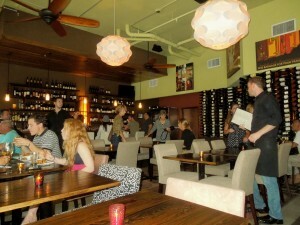 I love the way Brule Bistro has evolved. 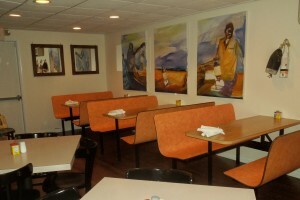 Love what they have done with the interior of the Bistro. I was told that in July they will be closing for a week; more remodeling, I believe in the kitchen area. The other night when we stopped for a bite to eat, the restaurant was comfortably crowded. I usually sit outside but being that it was a little too warm and it looked like rain was on the way, we played it safe, and inside we sat. I am glad we did because it was so nice inside. Brule Bistro makes everything in-house. It opens early and closes late. It is a great spot for lunch. 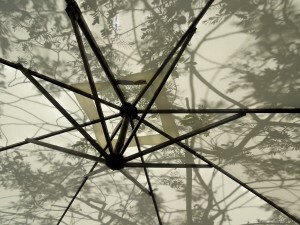 Sit under their umbrellas and enjoy the balmy South Florida weather. 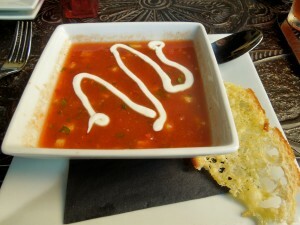 Try their Gazpacho with Yogurt Creme. It is so good and so refreshing. Even though their menu changes all the time; this popular soup is always on their menu. 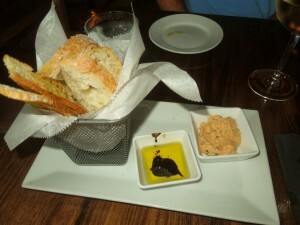 As we sat at our table, our waiter brought homemade bread with roasted pepper mousse. 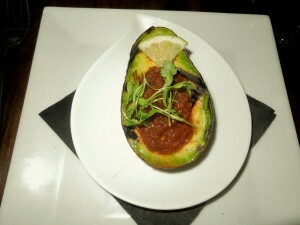 A Grilled Avocado with Roasted Tomato Salsa, sprinkled with Sea Salt and Extra Virgin Olive Oil was ordered as an appetizer. 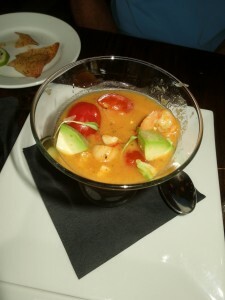 A Citrus Ceviche Martini with Bay scallops, Laughing Bird Shrimp, Sake and Avocado, was another appetizer ordered. Almost did not get the picture. My guest was too fast. 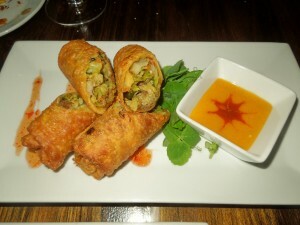 The Duck Confit Eggroll, House Brined and served with a Mango Mustard Sauce was well received. 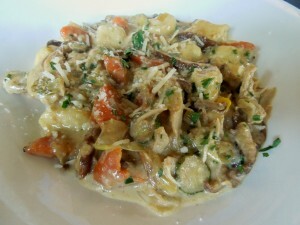 I had to order the Braised Local Rabbit Fricassee with Ricotta Gnudi, Oyster Mushrooms and Vegetable Fricassee. It brought memories from when my grandmother used to make it in Puerto Rico. Very good. For dessert, a decadent and Flourless Chocolate Dome. Dense and rich. Delray Beach has so many restaurants; it is so nice to find one so comfortable with good food, nice atmosphere, and most of all, attentive service, and reasonable prices. Until next time, Delray…have a good one!! It was the way the sun was setting about 10 days ago. I still remember because I was in Downtown Rehoboth Beach when I took off for Gordons Pond in a north section of town also known as North Shores and Whiskey Beach. 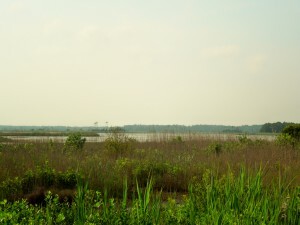 It is part of Delaware State Park. The beach on that side of town is quiet and even though it does have a colorful past; it is, definitely, a family beach. No guard was at the gate so I just went through. I was not even dressed for my hike on the beach. I don’t know what got into me; I wanted to see the WWII Towers. It’s so funny because these towers don’t change. They have been standing there as ghosts; guarding as they have been doing for so many years. 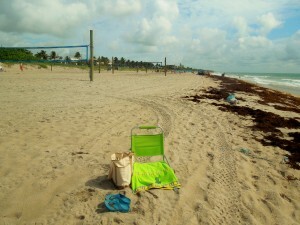 I started walking; pocketbook on hand through the path cars take when parking on the beach. Don’t ask me why. I could have gone by the water’s edge. But, I wanted a different view. The sand was a little deep and I was wondering how much farther I would have to walk. Finally, there they were. They looked so gorgeous, imposing, and majestic. 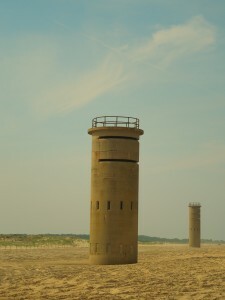 Eight of the 11 towers built along the Delaware and New Jersey coastlines during WWII are, here, on our Delaware Beaches; 3 in New Jersey. Tower 1 is in South Bethany. 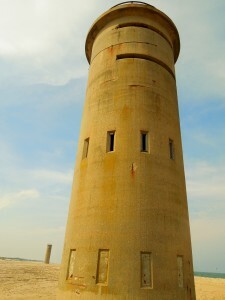 Tower 2 is south of the Indian River Bridge, Tower 3 and 4 are in Dewey Beach, and 5 and 6 are on Whiskey Beach. 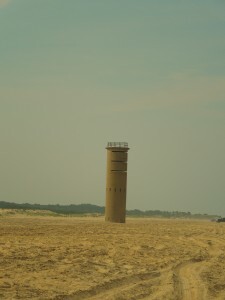 The 7th tower is in Lewes and the 8th in Broadkill Beach. The towers were used as artillery spotting locations. Our military would coordinate artillery fire on enemy ships off our coast from the towers. Some of the towers have different heights and some of them have only 2 viewing slits, while others have 3 or 4. You could also see about 14 1/2 miles into the Atlantic. 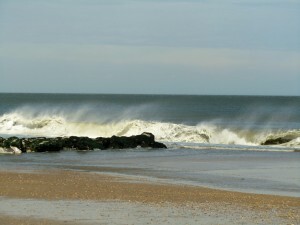 It was believed that after Pearl Harbor, the Delaware Beaches were in danger. In 1941 the German U-boats were sinking an average of a ship per week. Note: There is a book written by William C. Grayson called Delaware’s Ghost Towers, The Coast Artillery’s Forgotten Last Stand During the Darkest Days of WWII. You can get it on Amazon. Also, more info. on the WWII Towers can be obtained by visiting www.bethany-beach.net/world_war_ii_towers.htm. A couple of people were still at the beach. It was not the perfect beach day. A little too windy and choppy. I walked down Whiskey Beach and thought if there was any truth to its name. 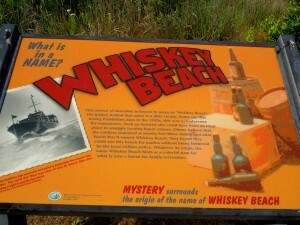 They say it is called Whiskey Beach because in the 1920s, during Prohibition, this beach was a rendevous for rumrunners. Others say it had been a place for soldiers to party while stationed at Fort Miles up the road with nobody to bother them. 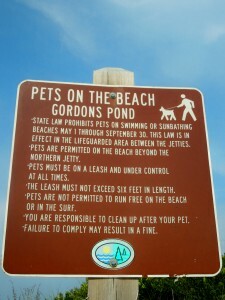 State Law prohibits pets swimming or sunbathing on the beach but past the northern jetty, they are allowed. It is, definitely, colorful and a conversation piece. Gordons Pond is on this part of the Delaware State Park, as well. It was getting too late, so I only walked for a short time. 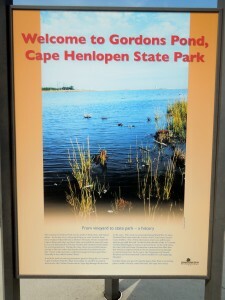 Gordons Pond is one of 4 migration “super highways” in North America. A popular resting spot for a wide variety of waterfowls. Other wildlife is pretty abundant by the edges of the pond. 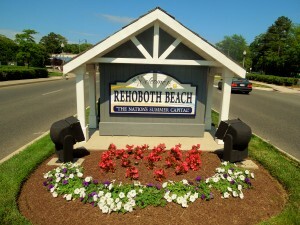 So, when you are visiting Rehoboth Beach and the downtown beaches are a little too crowded, head towards the Park on the north side of Downtown Rehoboth Beach. More info? 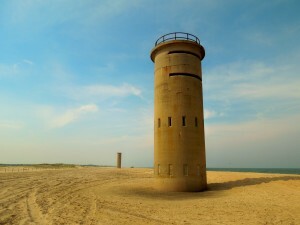 Please visit www.destateparks.com. 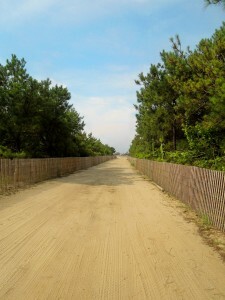 Just north of Ocean City, Maryland, and south of Bethany Beach, you will find the town of Fenwick Island. Sandy beaches, golf courses, eateries and a laissez faier kind of atmosphere. When people say you are on beach time; this is the town. 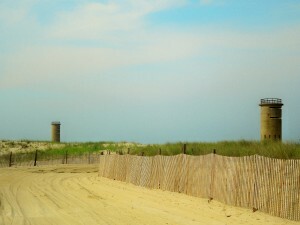 It is part of what they call The Quiet Resorts, which are Bethany Beach and Fenwick. 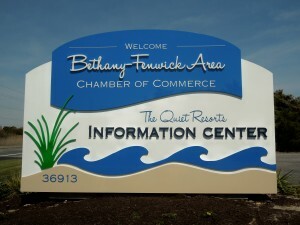 The Bethany-Fenwick Chamber of Commerce is located in Fenwick. You cannot miss it; it is right on Coastal Highway (Rt. 1) and it does have a new beautiful sign. Stop by for all the information needed to make your visit more enjoyable. Four miles west of Fenwick Island you will find The Freeman Stage at Bayside. Some say that it is the #1 best secret of Delaware, except it is not a secret anymore. The performers entertaining at this open air performing arts venue are nationally recognized. All you have to do is check their schedule by visiting www.freemanstage.org. 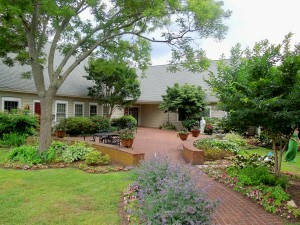 It is located at 31750 Lakeview Drive in Selbyville, DE. The entrance is right next to Harris Teeter. Tel. 302-436-3015. Directions: At the intersection of Rt. 54 and Rt. 20, turn into the Bayside community and proceed straight on Americana Parkway. The Freeman Stage is located on Town Lake at the intersection of Americana Parkway and Lakeview Drive. The Freeman Stage opened in 2008. Since it is an open air venue, just check the weather. Bring friends, family, chairs and blankets. Most performances are free; others you will have to check for admission and ticket information. There is a concession stand where you can buy sandwiches, beer, treats, and so much more. Thursday, 6/21 – Jesse Garron’s Tribute to Elvis – 7:00 – 9:00 p.m. They say he is the closest thing to the King. He has the voice, looks and charisma that made Elvis a superstar. Friday, 6/22 – It is Broadway at the Beach – 7:00 – 9:00 p.m. – This Clear Space Theatre Company’s, from Rehoboth Beach, electrifying ensemble of talented performers coming together to create this all new revue of contemporary and pop/rock hits from musical theatre repertoire. Classic rock musicals like Hair and Jesus Christ Superstar, to Les Miserables and Wicked. It is packed with all of the infectious irresistible show tunes everyone wants to hear. Admission? $10 Kids are free. Saturday, 6/23 – Storyteller for Kids – 10:00 a.m. until Noon. Gary Lloyd tells tales that buzz in your ears while answering the question, “Two bees or not Two bees?” His enthusiasm shows his love of his craft and his respect for his audiences. He won a national level award for his telling, but truly savors the comments he gets all the time from children and adults who rediscover just how fun and powerful storytelling can be. Wear yellow and black for a special present! Free. Tuesday, 6/26 – Fenwick Flicks: FREE Beach Movie ‘Dolphin Tale’ at 8:00 p.m. Location? 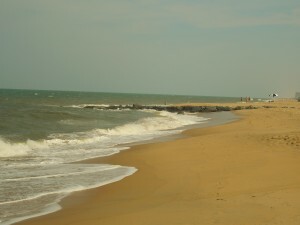 Beach at Farmington St. The Delaware Beach Towns are taking advantage of our gorgeous beaches; on balmy summer nights there is nothing better than to sit on the beach. Under the moon and stars they are offering open air movies. Take the family and friends, blankets and popcorn. Fenwick Island is offering monthly movies on this natural outdoor venue; the Beach. Seating is first-come, first-served. Pick up a “movie ticket” at the Chamber office, Town Hall and other locations throughout the town prior to the movie to take advantage of Fenwick Flick discounts on movie days. Please note that since it is outdoors, the weather plays a part, as well. In case it does rain, the movie will be shown the following evening. 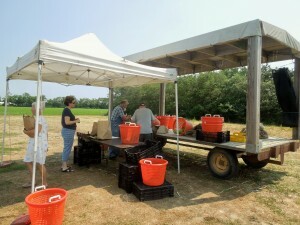 Fenwick Island Farmers’ Market – Not one, but twice a week, you will find farm fresh local produce in Fenwick Island. Mondays and Fridays from 8 a.m. until Noon. Location? PNC Lot( 1107 Coastal Highway) at Coastal Highway and Essex St. Park behind the vendors on the grassy lot. More info? Call 302-436-5589. 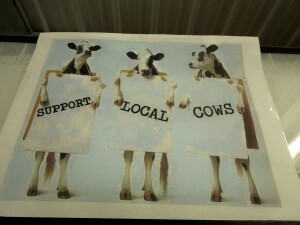 Or, visit www.fenwickislandfarmersmarket.com.